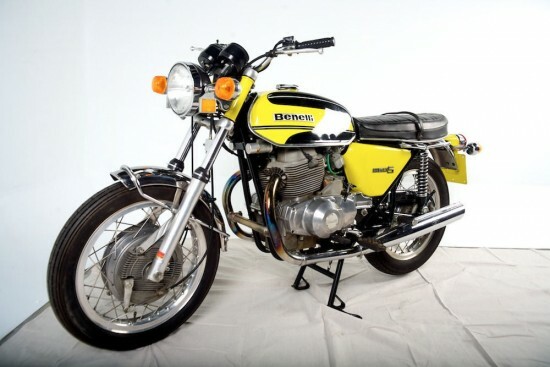 Built between 1968 and 1976, the Benelli Tornado 650S could be thought of the “Anti-Triumph.” While the basic pushrod 650cc, parallel-twin specifications suggest a bike superficially similar, it is very different in practice. Apparently, the Benelli twin actually has four flywheels, but for most of us, a clue about the character can be found in the hugely oversquare dimensions: 84mm x 58mm. No balance shafts here, but the engine is very smooth and loves to rev, compared to contemporary British bikes. 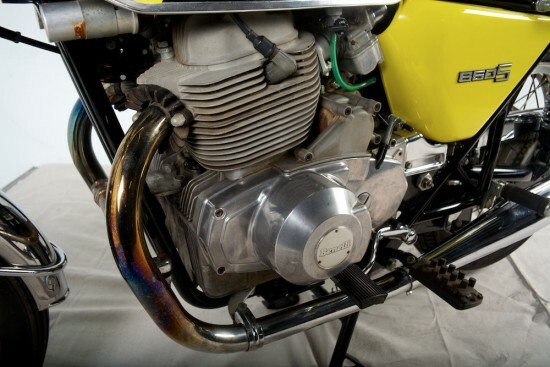 Amusingly, a bit of 70’s “anti-vibration” tech can be seen below: the long nubs on the footpeg rubber were designed to help isolate engine vibes that might be transmitted through the controls. While drum brakes may not have been cutting-edge technology by 1975, the huge, chunky piece here should provide plenty of stopping power for anyone prepared to accept the limitations of vintage brakes. 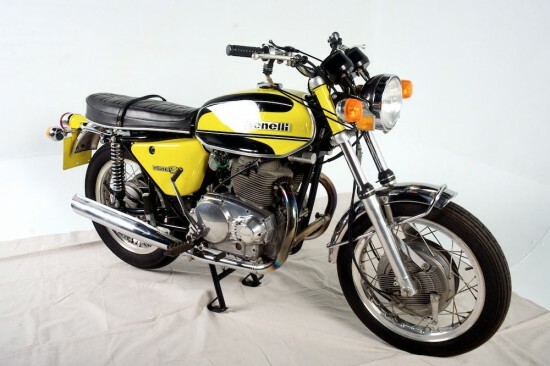 The original listing includes plenty of excellent, high quality photographs that show the bike in great detail. There are some minor blemishes and bits of corrosion, but overall, this bike is extremely clean, with only 60 miles. 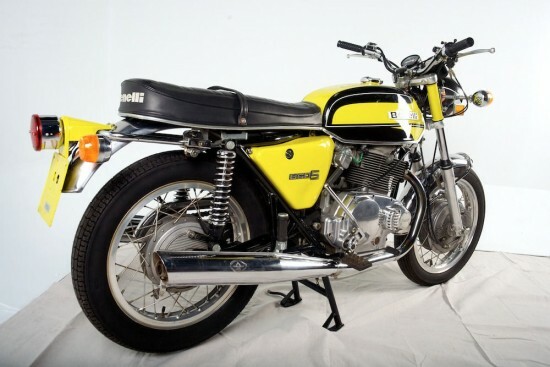 In extremely pristine condition this Benelli Tornado 650S is a perfect showpiece for Benelli’s unique Italian design and build quality. Indicated on the odometer, this Benelli has only registered 60 miles! 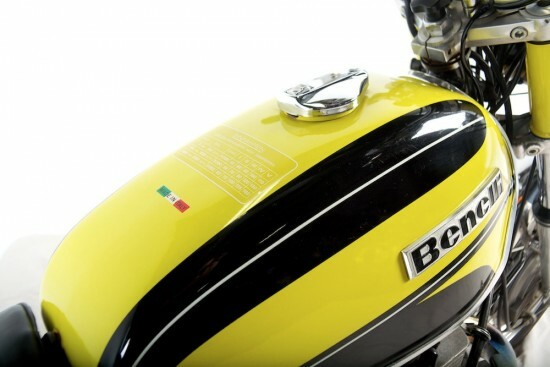 Painted in its original a yellow and black color scheme this motorcycle looks amazing. 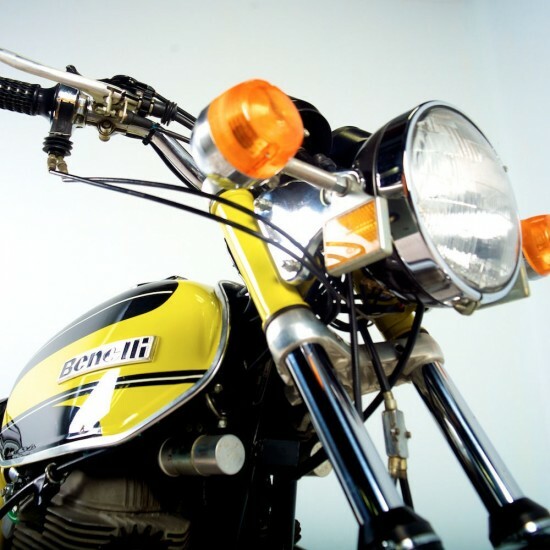 The paint is original and in ideal condition, only very minor imperfections can be found; but are negligible for original 40 year-old motorcycle. Every chrome and stainless steel accessory is original and in very good condition, almost no aging can be found. A black banana seat allows the rider have a comfortable and relaxing experience, with a natural riding position. Under the seat the original red tool kit is still in place with every tool being accounted for. 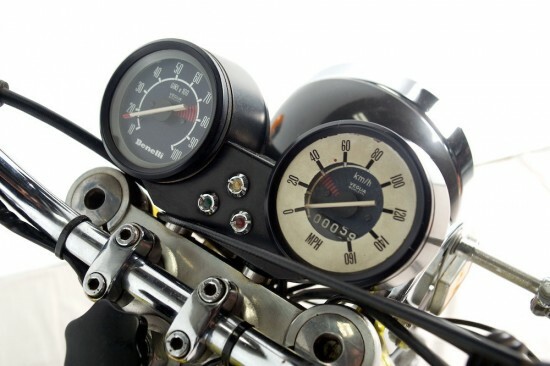 Original handlebars and Veglia gauges are in excellent condition, the handlebars still retain the factory hand grips too. Front and rear turn indicators work along with the original headlight and taillight too. It should be noted that this motorcycle was never been titled. It will be sold on Bill of Sale, with the original manufacturer’s statement of origin (MSO) in hand. $12,900 is obviously pretty big money for a Benelli Tornado. But, as was true for the Quattro that was featured here last week, that might seem like fair money to the right buyer. If you’re a collector and want the best, lowest-mileage example you can find, this has to be one of the most perfect and original Tornados in existence. 60 miles ?? Those pipes are quite blue for only running 60 miles. Plus there’s a lot of dust etc blown on the cylinder fins. $12900 appears to be way optimistic. Max bid $6700 with 28 bids. I thought the reserve was high, per Peter Egan’s “Pizza and Beer” scale of motorcycle values, $6000 to $8000..